Grand Ayatollah Sistani’s objection to Syrian President Bashar Al Assad and Iraqi Prime Minister Nuri al-Maliki staying in power puts him in direct conflict with Iran's Supreme Leader Ayatollah Ali Khamenei, who backs both Syrian and Iraqi leaders. Iraqi Shia strongman Moqtada al-Sadr is an adherent of Sistani. Davutoglu is the most senior Turkish official to visit Iraq in two years. After his meeting in Najaf, Davutoglu described Sistani as the “safety valve” of Iraq who stands against Shia-Sunni sectarian conflict in Iraq and the region. Meanwhile, a bomber wearing a police uniform today detonated an explosives belt in a crowd of Shia pilgrims in the eastern Iraqi city of Al Sadiya, killing 35. Q) What is your idea about marshmallow and gelatin? A)----- If it is known that it comes from animals, the use is not allowed unless one knows the animal has been slaughtered according to Islam. Q9) Is it allowed to eat at McDonald restaurant? A9) You are allowed to eat those meals which do not contain meat. And you can eat meat also, if the seller is a Muslim and that the seller has made sure that the meat belonged to an animal that had been slaughtered according to Islamic conditions. Ultimately the moderates's like the grand ayatollah's voice should head way for a reconciliation with the west. But I also think another shah is bad..so must protect against that. Also why can't we have nuclear? Just because we have oil?? And so should you for telling him that. loads of mozakhrafat from an old fart. the problem is that there are those in 21st century who believe in that nonsense. these are an part with judaism. both backward and bankrupt ideologies that belong to dark ages and theor sole aim is to make sure that other people (non jews, non muslims) treat the followers of islam as judaism as social outcast. if the idea is that you are superior to anyone else in judaism (you are the chosen people) and in islam (everyone else is nagess etc) then what hope is therre. I am seriously disppointed that a man of his calibre will ever resolve that removing Assad or Maliki will bring an end to secterian unrest. It is just a further indication that not every one has good understanding of what is happening. His purpoted solution will not be conclusive without the eradication of Hezbolla, perhaps he forgot to mention that. There are issues that need critical examination before we deem some things are right or wrong. Okay, how in fact Assad constitutes a problem, who perceived him as a threat, what could be their reason, are these reason justifiable or acceptable to a rationally thinking man? 1)The house of Saud seeks to preserve their rule and maintain a signifant influence in the region. So THEY HATE TO SEE INSURGENCE OF DEMOCRACY in the region or seeing any other regional country becoming over influential. They can hardly bear it. 2) Isreal has grand plan for expansion and wants to dictate the tune in the region. They can not bear anything standing in their way. These two issues have always stay beneath all the problem in the region. So how is removal of Assad and Maliki resolve these two issues? Somebody should please explain to me. The real enemies of the region hide behind secterian conflict because it happens to be a good weapon now. When this weapon becomes obsolete, they will introduce another new weapon. If you still do not understand, then I am scared when you will. A word is enough for the wise. maybe you haven't fully grasped what He is saying!.Take time to read the full statement from him!. You may think what you like. But at end of the day it is the Iranian people that will decide what is good or bad to be protected against. What we don't want for sure are these damn mullahs and their minions as well as all those traitors (melli masabe and others) who betrayed Iranian people to these vermin. OR he's been bribed by that Saudi prince and them other despots. Anon 9:59 AM......I agree we can't allow those traitors to betray Iran ever again. As the old saying goes,"once bitten twice shy" comes to mind. It is funny how some people who claim to support democracy yet decide already for the Iranian people what type of future system of government there should be in Iran. A system like UK,Sweden and Japan which are monarchy and just so happens to be the most advanced countries in the world are just as valid as is the systems in USA,France and Germany,if not better. You may be right anon 10:47...he's perhaps been recieving threats also. The grand ayatollah, who by the way has the authority to issue fatwas, is prohibiting the Shia militias to fight on the side of Assad’s government to kill fellow Muslims, and he is calling on the Iraqis to form a real national unity government comprising of Shias, Sunnis and Kurds. Which part of this should we grasp differently? Rest assured that this post was not based on a report from Fars News Agency! True. Islam, Judaism and the other religions are all nonsense that keep people backwards in a dark ages mentality. Time for people to grow up and move on from religions. B.M.A is only interested in war and killing "zionists". You mean FARCE News Agency! we can find out, is it a fake news. The opposition of Ayatollah sistani to assad , maleki and iran is great sensation that must be headline of many news agency like Al jazzera,.. It is indeed the dream of the Iranian leadership to have a serene and stable IRAQ ,a Nation that would bring all in its leadership!.But what you are portraying is an irresponsible IRAN leadership sponsoring mayhem in the region which is not the case!.and i believe you did take the Grand Ayatollahs words out of context! The reference to Iranian leadership was a statement of fact the Iranian leader supports Assad and Maliki, with no discussion on the "irresponsible" nature of such support. However, you still have not told us how differently should we grasp what the grand ayatollah was saying. What is "right", reader? If the Iraqi and Syrian leaders leave their positions, then what? It seems the anti-Iran and anti-Arab people are quick to make demands but, not so quick to say what would follow. Is it "right" that those who seek to over those countries are head chopping, al qaeda cannibals? Is that what you are advocating for Iraq and Syria? Do you really consider Grand Ayatollah Sistani as anti-Arab and anti-Iranian? On what grounds? Don't tell me on the grounds that you disagree with his politics! Who said grand wizard of the fictional sky fairy Sistani was anti-Iran or anti-Arab? No, what was said was "It seems the anti-Iran and anti-Arab people are quick to make demands but, not so quick to say what would follow." It's clearly a reference to many of the people commenting on this site. Uskowi, are you really advocating that al qaeda cannibals take over Iraq and Syria? Have Ayatollah Sistani ever demanded that Bahraini clique of rulers will be removed and replaced by an representation of the 70 % Shia majority ??? I could turn the argument round and ask: Is it "right" to support a non-elected dictator from a minority Alavite sect ruling over a majority Sunni population? But "wrong" to support the Sunni Bahraini ruling over a majority Shia population? Assad my be a benevolent and a non-western-stooge dictator, but dictators are dictators, and should not be supported by any moral standards - be it religious or non-religious. 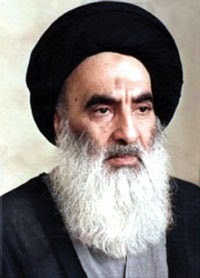 As a spiritual leader, it is Sistani religious duty to distance himself from the political consideration and support what is right for the Moslem world. Sending zealous Shia youngsters to Syria to fight a sectarian war is like fighting fire by fire. reader, it seems that those supporting the al qaeda cannibal terrorists are the ones who think that it is right to support one kind of unelected dictator in Bahrain but, wrong to support another in Syria. The anti-Syria, anti-Iran people commenting here, are noticeably quiet about the dictators that the USA and the zionist occupation prefer. "Sending zealous Shia youngsters to Syria to fight a sectarian war is like fighting fire by fire. " If that is so, are you equally against sending zealous wahabi/al qaeda youngsters to Syria to fight a sectarian war?